The legendary James Braid, x5 time Open Champion, arrived at Brora in 1924 and gave the existing course a makeover leaving his indelible stamp of several testing par 4's, requiring good medium-long irons into the greens, adding four tricky par 3's and a solitary par 5. Being around the 6,000 yard mark it may not be of a torturous length but I would warn against complacency, especially on a Braid course. This is a classic links layout (nine out and nine in) set between a pristine beach, running parallel to the course, and the great rolling hills of Sutherland. It is quite easy to transport oneself back to the early half of the 20th Century as the round unfolds, surrounded by the Highland quiet, with only the uninterested glances of the cows and sheep, who have seen it all before, intruding on the serenity. From the moment the magnificent Art Deco Clubhouse comes into view your senses are assailed by the setting, facilities and the anticipated golf to come. This has quickly become a must play golf links in Scotland and will only add to the pleasure that can be found when golfing in the Highlands of Scotland. Holes 1-3 go away from the clubhouse, running level with the water of the Moray Firth lapping on your right before it then gently moves, via the Par3 4th, to the upper level of the front nine giving spectacular views across to the Black Isle and returning to the halfway house. The Par4 10th returns you down to the waters edge where one stays for a super wee Par3 at the 11th and the Par5 12th before moving to the upper level and the 13th. As on the front nine the golf holes continue to offer golfers the option of playing thinking golf from the tee or boom and bust, classic pitch & run approaches or go-for-it in two Par5s. I believe that nothing can prepare the golfer for the sheer joy of golfing this classic Scottish links golf course. 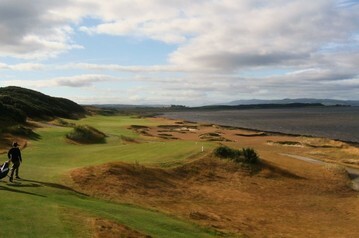 Enjoy the photographs and include this wonderful golf course in your Scotland golf tour. Nairn is a delight. It sits adjacent to the sea, Moray Firth, which is visible from nearly all 18 holes as are the occasional glimpse of dolphins. Situated 10 miles east of Inverness the greats of Scottish golf design have been involved in its evolution, the Simpson family from Carnoustie built the course in 1887 with Old Tom Morris and James Braid playing their part in the links we see and play now. Renowned for the quality of the greens it also has testing Par 4s and three big +500 yard Par 5s. The Curtis Cup was played here in 2012 with the British team defeating the USA as did the British Walker Cup team in 1999 which included a young Luke Donald. Founded in 1780 by the Society of Aberdeen Golfers giving it the accolade of being the 6th oldest in the World, these are also the chaps to harangue or perhaps applaud for introducing the '5 minute rule' when searching for your ball. The course moved to the present location in 1887-8 when Robert Simpson created this links beauty, alongside a stunning beach, to the north of Aberdeen and James Braid later placed his genius on the course by lengthening and adding some bunkers. The outward nine follow the beach out to the furthest point of the course and they have the reputation of being the stiffest test of any outward nine in links golf. Some high tee positions, offering drives to rolling fairways between sand dunes and tough rough, it is demanding but also perversely rewarding. The inward nine, shorter by 190 yards, come back on a plateau and gentler terrain to the 18th green, in front of the grand old clubhouse. The course has been lengthened in recent years and now plays at 6900 yards from the Medal tees. There are many who advocate that it should have hosted an Open Championship and who is to say it will not as it has been announced it will be the venue for the prestigious Europen Tour Scottish Open in 2014. It was host to the British Seniors Open won by Tom Watson in 2005. This is regarded by many in the know as the pinnacle of Old Tom Morris's golf course design. He came to Dornoch in 1886 with John Sutherland and redeveloped the nine existing holes and planned nine more. John Sutherland, the Club Secretary for 50 odd years, worked on these designs and there then followed the Morris devotees, Donald Ross (Pinehurst No2) and George Duncan, to assist in the development of the course to what we know now. The classic out & in layout contains the Morris hallmarks of wide fairways, countless bunkers positioned just right, a few blind shots and enormous plateau greens that are completely in tune with the setting. A true test and a joy to be able to play whether low or high handicapped, especially when the gorse is in full golden bloom during the months of April and May. 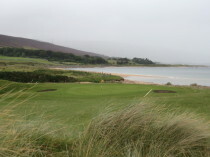 We stumbled upon this links course while driving along the Highland's East Coast road on route to golf at Nairn and Castle Stuart at Inverness. Thank goodness we decided to stop and golf at Fraserburgh because this brilliant course has everything one could want from a Scottish links golf course. Redesigned by the marvelous James Braid, 5 time Open Champion, in 1922 it incorporates great views to the Fraserburgh Bay and the North sea once you have climbed to the 3rd tee, huge undulating sand dunes especially on the back 9 holes, classic blind golf shots and fun greens. All a golfer can ever want, a joy, real golf for real golfers.